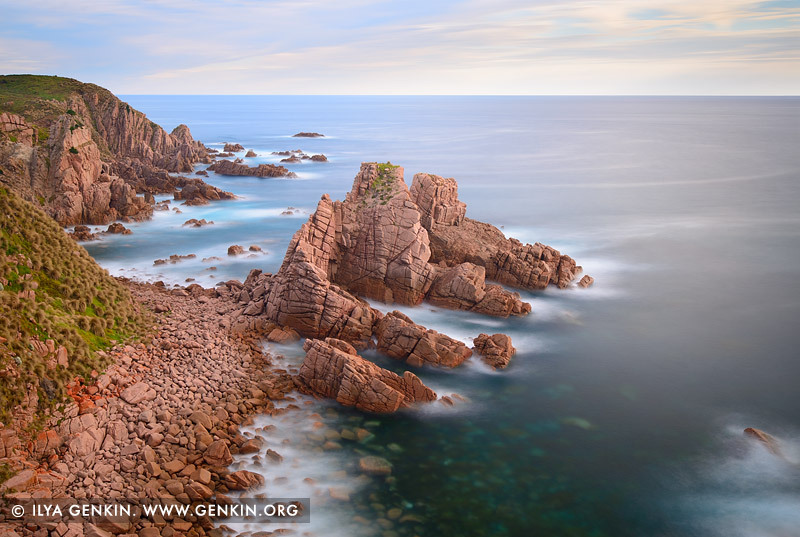 Granite rocks of the Cape Woolamai at sunset on the south-west tip of Phillip Island, Victoria, Australia. The name Cape Woolamai, was originally given by navigator, George Bass in 1798, describing the area as 'a high and rather steep cape resembling a snapper's head.' The name for the Cape was adopted from the Aboriginal, 'woolamai', meaning snapper. From 1891, the red granite in this area was mined from Red Point, Cape Woolamai, and shipped to Melbourne, where it was used for many of the early buildings in the City of Melbourne. This image belongs to the travel and nature stock photo library. This stock photo of Sunset at Cape Woolamai is available for licensing for commercial and editorial uses including websites, blogs, books, magazines, brochures and advertising. Restrictions may apply for images which contain third party copyrighted material or sensitive subjects. Photos of artwork are for editorial use only. This image id AU-CAPE-WOOLAMAI-0002 of Sunset at Cape Woolamai, is copyrighted © by Ilya Genkin. This is not a public domain image.